Genetically determined differences exist between inbred mouse strains in the magnitude of the macrophage inflammatory response following elicitation with phlogistic agents such as thioglycollate (Stevenson, Kongshavn and Skamene 1981). This phenomenon was shown to be associated with a deficiency in the fifth component of complement (C5) in mouse strains which exhibited low macrophage inflammatory responses (Gervais, Stevenson and Skamene 1984). The present study was designed to further investigate the genetic control of the macrophage inflammatory response, using as the low responder strain the Balb/c mouse which is C5-sufficient while being a low macrophage inflammatory responder (unpublished observations). 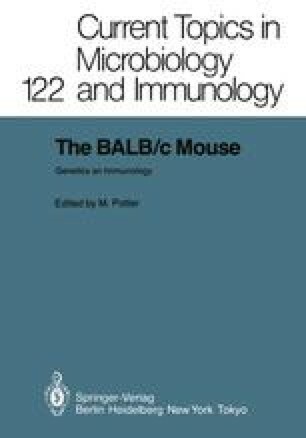 Genetic analysis was performed by typing for the trait of macrophage inflammatory responsiveness in recombinant inbred (RI) strains derived from Balb/cBy (low responder) and C57BL/6By (high responder) progenitor mouse strains.